Not everyone has the long, slim fingers of a hand model, but that doesn't mean you can't find a ring that looks gorgeous on your hand. Certain styles can even visually slim and elongate your hands, and you can rock some designs that would overwhelm tiny fingers. 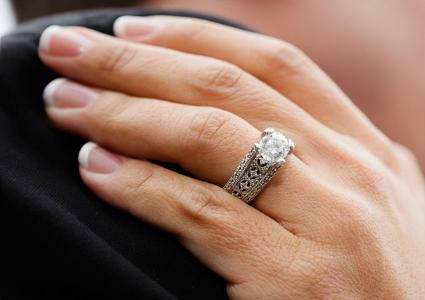 Keep these tips in mind to find a ring you'll love for decades to come. Not that you needed an excuse to show off a really big center gem, but thicker fingers are ideal for large stones. The larger gem will look at home on your hand, and its size will visually slim your fingers. The gem doesn't have to be a diamond, especially since multi-carat diamonds can quickly get very expensive. Consider sapphires and other colored gems. Anything substantial will look great! Give some thought to halo settings, which can add more visual impact to the center stone by surrounding them with several smaller gems, often diamonds. You don't need to surround the gem with diamonds if you have something simpler in mind. Choose a bezel setting or an accent of a contrasting metal color to give a small or average-sized stone the impact of a larger one. Visually, a thin band can actually emphasize the width of your finger. If you'd like a slimmer appearance, it makes sense to choose a wider band instead. Whether you love modern designs or more elaborate styles, there are tons of wide-band options to consider. Look for something more than three millimeters in width, so it has the substantial feel of a wide band. There are even bands five or more millimeters wide that will look right at home on your hand. For a more modern look, go for a band that's about the same width as the gem you select. That way, the entire ring will have a sleek, low profile look. If you prefer graceful filigree and accent gems, there are also some great wide-band looks. Because the band itself has so much space on it, there are many wonderful ways to embellish it. If you don't want a wide band that goes all the way around your finger, a wide setting can have the same visual effect. 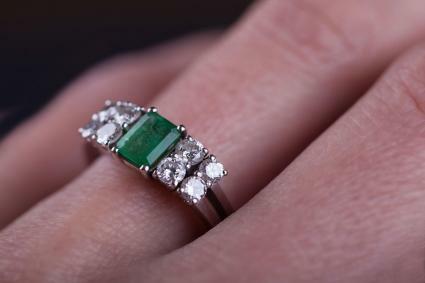 Ideally, the design won't have much of your finger showing on either side of the center stone. This makes your finger appear more slender, and it gives you lots of fun options from which to choose. A three-stone design is a classic engagement ring choice, and it's perfect for visually slimming your finger. In this type of design, a simple setting is timeless and elegant. Consider an antique-style ring with an elongated oval or rectangular motif. The width is perfect on your finger and the sparkle of filigree or micro pave diamonds gives it plenty of style. Five-stone rings are another option you may like. They are often tapered from a larger center stone to smaller stones on the outsides, and this can create a slimming effect. You have a unique opportunity that people with thinner fingers do not; you can wear just about any statement ring and have it look gorgeous. Larger statement rings help your fingers appear more petite. Think of your fingers a blank canvas and go crazy. Look for a cluster ring, possibly in a flower design. This is a beautiful, feminine look that looks delicate, even on larger hands. Consider an asymmetrical design, which could easily look unbalanced and too bulky on small fingers. On your hand, it will appear modern and avant garde, an artistic style statement everyone will love. Don't forget colored gems. You can combine any shade you love with diamonds or with another bright gemstone, creating a fun and colorful look that will be right at home on your hand. Most rings come in standard sizes up to nine, but if you have thicker fingers, you may need a larger size. Many jewelers will make rings in larger sizes, usually for a fee based on the materials required. You can also have a ring custom made by an artist or have a ring resized at your local jewelry store. If you plan to resize a pre-made ring, confirm that resizing is possible before you buy it. While many styles are easy to resize, some designs (such as those with engraving, lots of gems, or filigree) may not be sizable. 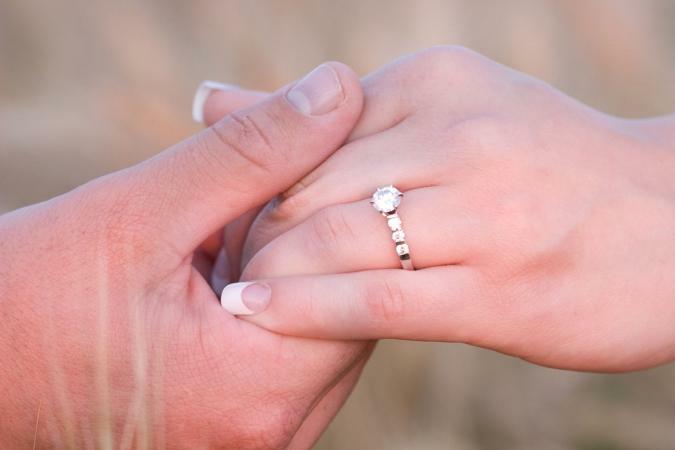 You aren't limited in your engagement ring choices by having thicker fingers. In fact, you'll find that you have options many other people do not. Take some time to try on a few rings and see what you like best. Smart shopping will get you a ring you'll love for the rest of your life.